Danielle Clore, the CEO of Kentucky Nonprofit Network (KNN), began her work in the nonprofit sector at a young age. She would follow her grandmother going door-to-door in their neighborhood to raise funds for the American Heart Association and the American Cancer Society. From this experience, her fascination with philanthropy grew into the service she does today. For her undergraduate degree, she majored in psychology, and wanted to work for a human services organization. “There was no internet, so while working on my degree, I mailed my resume to every human services organization in the phone book seeking work part-time,” Clore recalls. She ended up working for the Catholic Social Services Bureau, which provided adoptions services and a sliding scale fee mental health clinic when mental health care was not covered by insurance. When Clore first graduated, she envisioned working as a therapist and obtaining a master’s degree in social work. However, while working for the Catholic Social Services Bureau, she realized that she actually wanted to help run nonprofits. With this shift in trajectory, she received her Master of Public Administration from the University of Kentucky. While the curriculum was not specifically meant to be applied to nonprofit work, Clore found the crossover between her degree and her goals. “I could use the coursework for nonprofit management, but it required always looking at things a bit differently,” Clore says. The University itself was flexible in allowing her take electives in other degree programs within and outside the University, which also provided her with more relevant experience. Since obtaining her master’s degree, Clore has held multiple roles in development and fundraising and founded what is known today as KNN in 2002. She left a position as director of the major gifts program with the Kentucky Educational Television Foundation to work at the University of Kentucky creating an outreach program for nonprofit leaders. This work evolved into an independent nonprofit organization that is Kentucky’s state association of nonprofits called Kentucky Nonprofit Network. “Our mission is to advance Kentucky’s nonprofits,” Clore says. “We unify and educate nonprofits about the public policy threats and opportunities that exist.” Clore notes that 9.1% of employees in Kentucky work in nonprofits, and these organizations bring in $27.3 billion in annual revenue. Clearly, the success of the state’s nonprofit sector has a major effect on Kentucky overall. “There is a big discussion in Kentucky about quality of life, and providing a quality of life to help people stay in the state by bringing jobs to Kentucky,” Clore says. 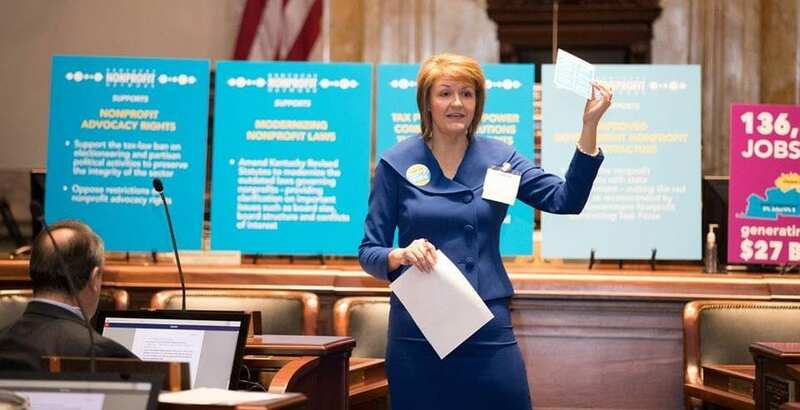 “We’re helping nonprofits understand that they are essential to quality of life and are very important economically.” Behind the mission of KNN to support the state’s nonprofits, then, is also the mission to benefit Kentucky. As KNN has moved forward, it has shifted its focus to providing resources that are specific to Kentucky. The organization hosts an annual conference, as well as a yearly day at the state capitol building. At the end of 2017, KNN held forums around the state to talk with as many nonprofits as possible about the public policy issues impacting them. Looking forward to 2018, the organization’s continued engagement and care for this sector is especially important. “People are talking about the notion of a ‘perfect storm’ for nonprofits,” Clore says. She cites an increased demand for services with nonprofits facing many unknowns, including the new federal tax law, federal spending, and Kentucky’s budget and tax woes. However, as nonprofits face these challenges, KNN remains a resource for them. With new federal or state laws, KNN helps nonprofits determine what certain requirements or programs mean for them. The doubling of the federal standard deduction, for example, will require innovative thinking regarding fundraising. KNN, under Clore’s leadership, is urging nonprofits to rethink their fundraising strategies, as tax deductions may not be a large motivation for as many donors as it once was. Clore is also closely monitoring a new Medicaid work/community engagement requirement in Kentucky so that KNN can help the state’s nonprofits understand what participating in helping Kentuckians meet the new requirements could mean for their organization, including effective risk and volunteer program management. To make these important resources more readily available, KNN looks to improve its processes in a variety of ways. The organization recently introduced a new database to streamline communication with both members and non-members. For members specifically, KNN also has a new online member portal for members to access templates, sample policies, and other tools. The organization has curated these resources around key nonprofit management topics like fundraising and finance, as well as information on maintaining status as a nonprofit and best practices in nonprofit leadership. Beyond access to information, KNN members also have access to benefits designed to save nonprofits time and money, including a health insurance program. The program has been a boost for small nonprofits who report KNN’s program allows them their first opportunity to offer benefits to their staff. KNN has also hosts Kentucky Gives Day—a statewide, 24-hour, online fundraising event designed to showcase the important work of nonprofits, especially rural nonprofits, and to encourage philanthropy. Participation in the event is a free KNN member benefit. Clore hopes that those inside the sector and outside of it can more clearly understand the role of nonprofits in society. Ultimately, the success of Kentucky’s nonprofits is crucial to the well-being of the rest of the state, and KNN’s mission helps this sector flourish.